We’re all in a tizzy over Gears of War 2’s long matchmaking wait times, shielded shotguns, and invincible chainsaws, but there’s something about the game that’s bothered me far more than those trifles. This dates back to the first game, and in fact hits upon the very premise on which the series is founded. It’s a flaw in the combat system, a crack in Gears of War’s foundation that spreads from the single player to the multiplayer, and persists into the sequel. Would you believe it’s something as seemingly minor as regenerating health? Stay with me. Like any great shooter, Gears of War hinges upon the idea that the humans face nearly impossible odds in their battle with the Locust. After seeing so many of your comrades become easy fodder for the enemy’s rifles and torque bows, it’s satisfying to step in as the muscular hero and lay the opposition to rest. But this battle gives no perception that the odds are stacked against you because Marcus and Dom have an unfair advantage. It’s never explained why, but when damaged, you can recover fully by finding a place to hide and waiting until the so-called “Crimson Omen” fades from view. This mechanism has become all the rage in video games since Halo popularized it, but only that series creates a rationale in the form of Master Chief’s special armor. Still, I’m less concerned with the plot implications of regenerating health than what it means for the combat. Because the Locust aren’t given the same luxury, the winning strategy usually consists of finding a good place to hide and gradually working each enemy with the Lancer until they run out of health and drop to the floor. You don’t have to rely on any overall tactics for each challenge; it’s just a matter of having enough ammo and patience. Not only is this tedious, but it undermines the spirit of the game. Now, let’s stoke the fanboy flames a little and compare this to…Halo: Combat Evolved. Your main enemies in this game were the Covenant Elites, and they were menacing not because of their appearance, but because they were essentially an equal match to your abilities. If you started shooting one of them, but got distracted or had to hide and recover damage, the Elite would recover as well, and you’d be back to square one with less ammo. As a result, each Elite created its own individual puzzle, and heaven help you if there were more than one of them hanging about. You had to strategize, plan a route, duck out of cover and draw the Elites into view with a grenade, then concentrate all your fire on one of them before slipping back into the shadows. You reloaded, took a quick peak at who was left and stepped into the open for another precision attack. It was exhilarating and — when you finally stood among the wrecked corpses of your foes — immensely satisfying. Not so with Gears of War 2, in which the thrills are more in the moment of combat than a result of considerable efforts. It’s fun to pop a distant foe with your sniper rifle, and it’s even better to sneak up close and use your Lancer’s chainsaw, but it never quite compares to the feeling of outsmarting your enemies. For a game that claims to have more strategy than your average run-and-jump shooter, that’s a let down. 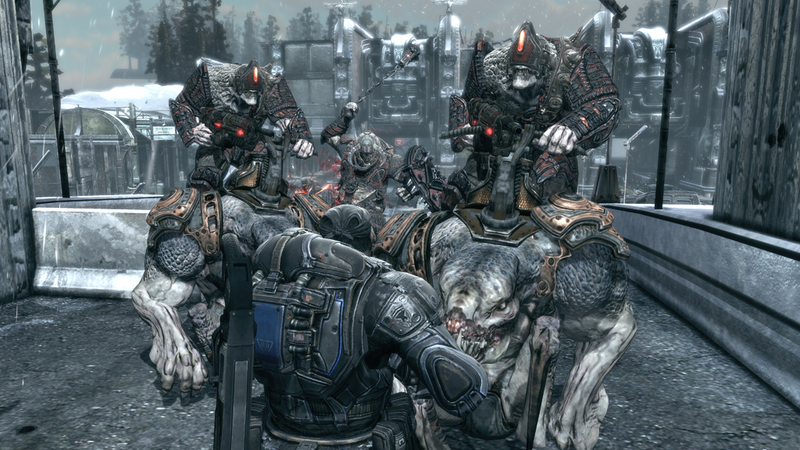 You could argue that Gears of War’s imbalance of regenerating and limited health is corrected in multiplayer. But the single-player game sets up an expectation of how multiplayer works, and you can see how fans are upset when they don’t get a similar experience. Think back to the original Gears of War. The overuse of the shotgun in multiplayer was a common complaint; players wanted to fight with their Lancers, like they did in single player. They didn’t want matches to be decided by whoever was best at shooting from the hip at close range. As a fix, Epic weakened the shotgun this time around, but that Band-Aid measure actually created more problems. Players continue to move in for the close range kill because it just can’t be done from afar, but they’re now using the chainsaw to resolve their showdowns. I don’t envy Epic for the gameplay situation they’ve created (though I do envy their success and resultant wealth). There are two possible solutions here, and neither is perfect. You could give the Locust regenerating health in single player, but this would force you to play an entirely different game. Your teammate would play a much greater role, as flanking and devising joint strategies would be crucial. This solution would also change people’s expectations and perceptions of multiplayer, as they’d probably be using similar close-quarters strategies in the solo campaign. Of course, that idea is too unpredictable. There’s no telling how people would respond to such a drastically different single player experience, and it’s possible that players could still resent the multiplayer. A better solution might be to eliminate regenerating health altogether. You could instate health packs, but a solution similar to that of Ninja Gaiden 2 might work best, in which you’d have a finite amount of health that restores after the enemy threat is neutralized. This translates well into multiplayer, as you’d simply have limited health for each round of play. I’m no game developer, and I know a lot of them hate this kind of Monday morning quarterbacking, but that’s why we’re here. That’s why everybody complains about shielded shotguns and infinite matchmaking wait times in the first place. Despite what I’ve just said, I really did enjoy playing Gears of War 2 for its white-knuckle set pieces and oozing testosterone. I write these things not out of hate for the franchise, but out of love. Would you believe it?